As a virtuoso of historical flutes and recorders, conductor, educator and scholar, Greg Dikmans has been at the forefront of the early music movement in Australia since the late 1970s. Greg Dikmans…indulged in physiologically and musically astonishing flights of brilliance. [They] belong to the top bracket of Australian instrumentalists. Greg Dikmans was an outstanding soloist in [Bach’s Sonata for flute in E Minor], in complete control throughout, shaping phrases with the utmost sensitivity. 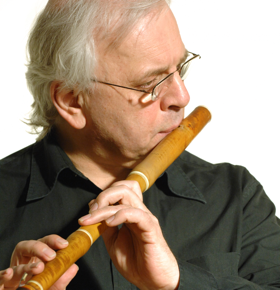 The baroque flute…[has] its own distinctive and beautiful sound in the hands of a master such as Greg Dikmans. The music itself offered a diverse world of aural pleasures. But it was the performances that united these elements [the music, the style of performance, and the acoustic] into a pleasing exhibition of antique works which remain, in such hands, treasured pieces, as capable now as some 250 years ago of bringing happiness to mortal ears. For this praise must go to the leader [of the Elysium Ensemble] Greg Dikmans, whose playing captures the spontaneity and grace of this music. The performances were, as usual, splendidly shaped and illustrative of the intelligent preparation that the [Elysium] ensemble puts into each of its programs…In all, a highly rewarding evening of solid and polished music-making. [T]he stamina and the concentration required from Greg Dikmans in this taxing program was enormous. Despite this, the integrity of the music was never compromised. The recital began with Variations on Doen Daphen d’over schoone maeght composed by Jacob van Eyck in 1646. It was played by Greg Dikmans…on solo descant recorder as he stood on the pulpit of Christ Church. This was a most eloquent performance made the more significant by the player’s position in the building. Van Eyck’s composition may not have been the Song of Songs but there was a narrative force in the music’s monologue that seemed both intimately personal and uplifting as played by Greg Dikmans. Elysium proved that its name is no idle boast. The playing was little short of perfection—and bliss abounded. The source is Dikmans himself…[h]is volume is rarely much above a whisper but the tone prances and bounces with Puckish vigor and carries like a summer zephyr. Although there is no doubting the seriousness of his mission, his playing is infused with lightness, even levity, imparting frequent reminders that laughter is one of the joys of heaven in any definition. [The ensemble] succeeded in conjuring the irrepressible fire, passion and relentless momentum that lies at the heart of the baroque.